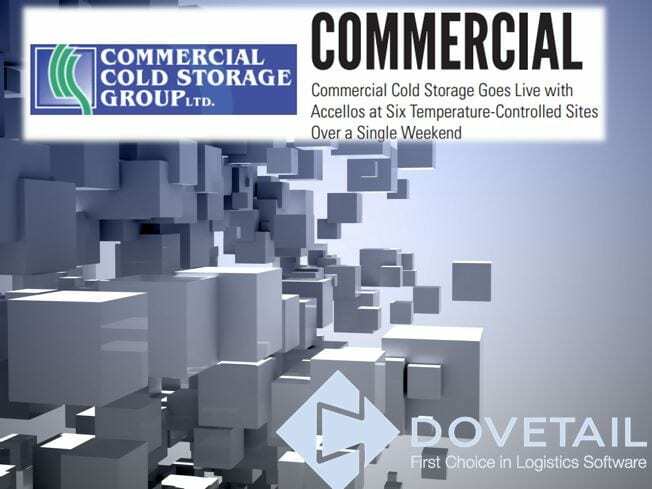 SOUTH AFRICAN 3PL PROVIDER COMMERCIAL COLD STORAGE GROUP LIMITED (CCS) GOES LIVE WITH ACCELLOS AT SIX TEMPERATURE-CONTROLLED SITES OVER A SINGLE WEEKEND. The go-live process can be intense under the best of circumstances, so consider the challenge when HighJump, Inc. implementation teams were called upon to bring up six free-standing but related temperature-controlled third party logistics sites simultaneously, each with its own set of customers and requirements, over a single weekend. Compounding the challenge was the fact that the customer, CCS, is in South Africa, was literally half a world away from HighJump’ primary 3PL services location in the Toronto area. Not a problem: dedicated teams were assigned to each CCS site, charged with implementing not only standard HighJump One 3PL features and capabilities but a variety of facility-specific functions as well. According to Francois Dowling, general manager of the company’s Cape Town facilities and executive in charge of the 3PL upgrade, the successful effort transitioned CCS from increasingly costly custom-programmed public refrigerated warehouse (PRW) software to a highly standardized state-of-the-art solution, paving the way to more efficient service, less costly domestic and international operations, and supporting new opportunities for growth. A subsidiary of Cape Town-headquartered Oceana Group, CCS is the largest 3PL provider in Africa, serving importers and exporters through three freezer/controlled-temperature warehouses in the headquarters city, one in Durban, one in Johannesburg and another in Walvis Bay, Namibia. Additional facilities in Durban provide 3PL services for the storage and distribution of fresh fruits and a variety of dry goods products, but do not utilize HighJump at this stage. The parent company’s operations have focused primarily on harvesting, processing and distributing fishery products for some 90 years. CCS was established in 1971 to accommodate Oceana’s frozen fish storage and distribution needs both in the South African and international markets. Today Oceana is no longer the primary customer, but about 25 percent of CCS’ operations are still devoted to fish, with the balance a diverse mix of perishables including meats, poultry, vegetables and fruits, juices, baking supplies, sauces and even pharmaceuticals, blood plasma and chemicals. From a single 3,000 pallet location site in 1971, the company’s temperature-controlled warehouse facilities now comprise more than 500,000 cubic meters of space, with some 106,000 pallet locations accommodating pallet weights of up to a metric ton. Individual warehouses range in size from 10,000 to 25,000 pallet locations. CCS’ facilities incorporate both fixed and single-deep mobile racking, with about 80 percent of the space now devoted to the movable storage. According to Dowling, mobile racking affords some 50 percent more storage space in each room where it is installed. The rows of racks move in and out of position on rails, creating a single pick aisle approximately 3.3 meters wide and enabling pallet handlers to easily reach pallets individually. Communication between the warehouse floor and the HighJump software takes place using Symbol MC9090 RF guns and a Motorola wireless data network using RFS6000 and WS2000 controllers. Services vary warehouse to warehouse depending on the needs of clients, some of which utilize multiple CCS facilities. The seaside sites, for example, are primarily engaged in receiving, storing and distributing fishery products and imports, while the inland Johannesburg facility is agriculturally oriented. One of the three Cape Town facilities as well as the Walvis Bay warehouse is optimized to receive fish directly from the boats. Conveyor systems are in place to speed-up movement of the offloaded catch from the vessels to pre-cooling, chill or freezer space. The Duncan Dock facility in Cape Town also does basic processing of fish. The Johannesburg warehouse is organized to deal expeditiously with a different set of products, much of it beef, mutton, and poultry trucked in from producer facilities. It features some 30,000 pallet locations, each holding up to one metric ton, and a blast freezing capability that can handle up to 60 tons of product at a time. Some facilities offer extraordinary flexibility: the Paarden Island warehouse in Cape Town, for example, has three chambers with a total of 6,000 pallet locations in its deep-frozen space, mostly devoted to fish. It features two chilled chambers with a combined 3,500 total pallet locations for storing fresh fruit or other chilled products, and five chambers with a total of 900 pallet locations for pre-cooling the fresh fruit or storage of chilled product at different temperature regimes. Chambers used for storing chilled products are convertible to deep frozen if needed. Read about Dovetails Relationship with Accelos WMS.